Forest fires cut off a village of 2,000 people in Portugal, as firefighters struggled Thursday to control two major blazes in the centre of the country, local officials said. And with another wave of hot weather forecast, the government declared a state of emergency in some central and northern regions of the country. Portugal's Interior Minister Constanca Urbano de Sousa meanwhile blamed arsonists and human negligence for most of the summer's fires. Vasco Estrela, the mayor of the embattled village of Macao, told the Lusa news agency: "It's impossible to leave or to enter Macao because of the flames and the smoke." The fire, which broke out on Tuesday evening, had grown stronger through Wednesday and by the small hours of Thursday morning had surrounded the village, he said, adding: "The fire is continuing unabated." The emergency services have had to evacuate around 130 people from nearby villages, said Patricia Gaspar, spokeswoman for Portugal's civil protection agency the ANPC. The forecast of hotter weather in the coming days—increasing the risk that old fire sites will rekindle or new ones break out—convinced the government to declare a state of emergency in parts of the country. Firefighters and locals were also struggling to master fires in nearby villages, including Sardoal, near Vale Formoso and Alcaravela, AFP journalists at the scene reported. "We came here to help the firefighters as best we can, by putting out smaller fires for example," said volunteer Ines Azevedo, from neighbouring Mouriscas. "In a situation this dire, any help is useful." 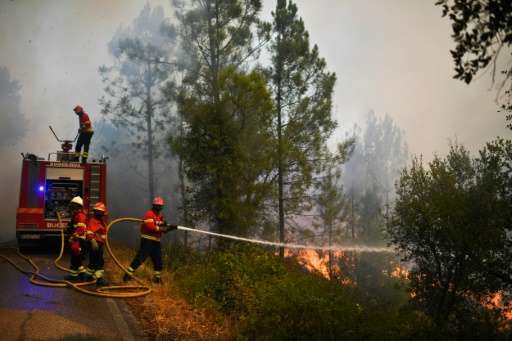 Already this month, this latest wave of fires has injured 86 people, seven of them seriously, while authorities last week had to evacuate 40,000 people in the town of Abrantes—about 20 kilometres from Macao. And this year's fires have been the deadliest the country has endured. 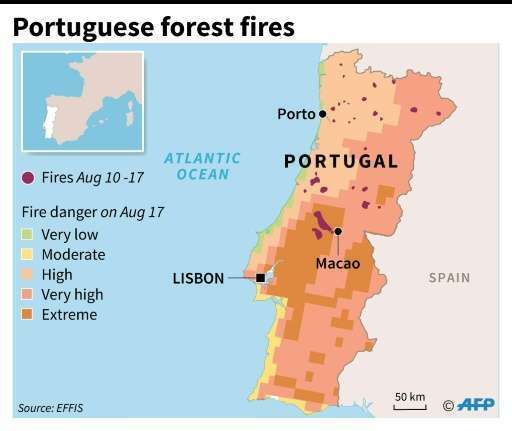 Wildfires in mid-June near Pedrogao Grande in central Portugal—about 40 kilometres north of Macao—killed 64 people and injured more than 250 others. Police on Wednesday said they had arrested 91 suspected arsonists since the beginning of the year. That was a record, said Interior Minister Constanca Urbano de Sousa on Thursday. "Most of the fires have been started by man, through negligence or malice," she said. Firefighters have had to tackle a little over 10,000 separate fires so far this year—2,500 more than at the same period in 2016. 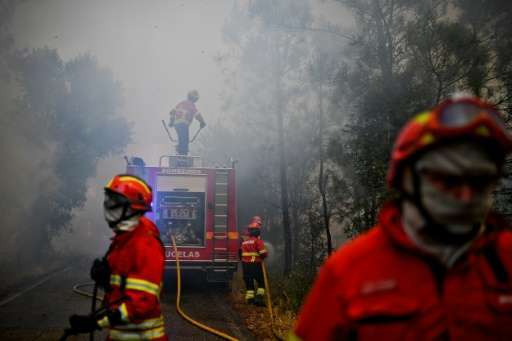 Over the weekend, Spain sent 120 firefighters, 27 engines and three firefighting planes to help bolster the exhausted Portuguese teams—part of a European Union programme of mutual aid in emergencies. Morocco too sent has one of its firefighting planes to help. In July, the parliament approved several measures aimed at cutting back on eucalyptus plantations, the most common tree being planted in the regions hit hardest by the fires—and extremely flammable.